From the first page when Loki interrupts the “official” introduction poem, you know this is going to be a special kind of book. The Gospel of Loki tells the story of Norse mythology from the point of view of the trickster god, covering everything from the birth of the Nine Worlds, all the way up to Ragnarok. And while its accuracy may be suspect, Loki assures the reader it’s as least as true as the Old Man’s version. Those familiar with Norse legends will note the presence of classic tales as Loki breaks from chaos and joins the gods in a series of adventures, all told in a new and enthralling way. The narrative and the voice of Loki is extremely well crafted, every page has the personality of the trickster stamped across it in some fashion. From his opinions of the world and the other gods to reflections on life and existence, the language evokes a very specific character. Instantly the reader begins to picture him as the bad boy rebel, something of a mischievous underdog to root for. The conversational tone as Loki tells the story encourages the reader to build a relationship with the character, leading to some moral quandaries later on as his actions grow more extreme. The language itself is very modern with contemporary slang terms that not only add to the feel of Loki as a modern rebel but provide an opportunity for moments of humour when juxtaposed with the archaic stories of ancient gods. The plot has Loki as the classic outsider, shunned because he is a creature of chaos, Loki struggles to fit in and find acceptance with the gods. His rivalries and conflicts make for great reading, first his attempts to win acceptance, then his schemes for vengeance when fitting in fails. The other gods are unsurprisingly portrayed in a less than flattering light, but over the novel the reader quite readily comes around to Loki’s way of thinking. From the start Odin is shown as a ruthless and manipulative power monger, forcing Loki to join him in his war against Asgard’s foes. Through the perspective of the weird kid in class the other deities don’t come across much better, each shown with very human flaws that the trickster exploits to deadly effect. The gods bring a range of diverse and dramatic personalities to form a great supportive cast, though none of them outshine our humble narrator. As the narrative progress the moral lines become murkier and the reader might begin to question their support of Loki. While a series of tough decisions may force his actions, Loki’s nature and his choices grow more difficult to defend. 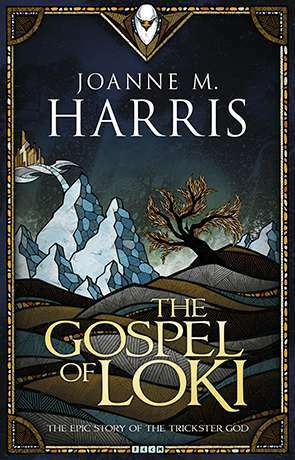 In a nice twist after building our relationship with the character, Harris begins to test our loyalty; Loki’s asides to the reader become almost pleading as he tries to convince us of his position. The climax of the book is suitably epic, threads pulling together and great revelations, though it did seem a little fast at the end. The reader is left with the feeling of waste at the stubborn pride of the characters and how it could have gone different. The Gospel of Loki is a great read, taking a very original, very different look at familiar subject matter and running with the idea. The world of the story is rich with lore and creatures from Norse mythology, populated with underground smiths, runic magic, bickering gods and giant snakes. Loki is a brilliant character and narrator, with a story that is both epic and deeply personnel. I can’t recommend the book enough. Written on 21st October 2015 by Aaron Miles.